In an interview with UK newspaper The Guardian Peter Moore reflected on Microsoft's relationship with Rare, stating Rare's ''skill sets were from a different time and a different place and were not applicable in today's market.'' Moore's harsh critique is hard to refute, as Rare has not delivered a blockbuster since joining Bill Gates' regime in 2002. This prized developer has slumped under Microsoft's guidance, peaking with the moderate success of the Viva Pinata series. 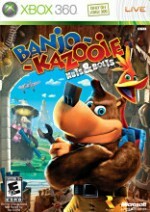 Even Rare agrees with Moore's negative assessment in the long overdue third installment in the Banjo-Kazooie series, Nuts and Bolts. As players follow the zany exploits of gaming's only bird and bear duo, Rare openly lampoons itself for having an outdated development philosophy. This game harps on Rare's insistence to make every game a collect-a-thon, and even goes as far to show one of the company's least popular games (Grabbed by the Ghoulies) buried in a cat's litter box. Protagonists Banjo and Kazooie, who are introduced as lazy, out-of-work, pizza-guzzling fatsos, are also thrown under the bus as archaic characters that no one could possibly love. Rare's self-inflicted stoning ends in an amusing history lesson that deftly blends legitimate laughs with a compelling commentary on the state of video games. This spoof cleverly pokes fun at the past and present, but the gameplay that goes along with it is firmly planted in the future. Nuts and Bolts throws Banjo's platforming exploits into the fires of mockery, and instead latches onto the next big trend in gaming, user-created content. Like Spore and LittleBigPlanet, Nuts and Bolts' gameplay is dependent on the player's imagination. Through remarkably deep building tools, players are tasked with building vehicles from a pile of parts. Picture, if you will, having access to the world's largest LEGO box, and having a skilled instructor at your side for any help you may need. If you are creatively challenged, you can always use one of the game's many blueprints. Should you choose to get your creative juices flowing, the building process is as easy as snapping two LEGO bricks together. The wide parts selection is broken up into categories that make finding pieces easy. The game also does a nice job of detailing when parts can or cannot be attached. To avoid trial and error, quick-loading test track is a click away. It's easy to lose your life in these excellent building tools, as you really can build any vehicle you want – be it an airplane, boat, an airplane/boat hybrid, or even a robot with rocket skates. It really is a game in and of itself. All of the vehicle types control amazingly well (unless of course you build 10-ton boxes that can't turn), and it's usually easy to pinpoint where a vehicle is failing and what you need to alter to improve its design. Projectile targeting is a bit suspect, but at the same time, your targets are rarely of the speedy type. The vehicles you create are used for a wide variety of goals in a game best described as Grand Theft LEGO. You won't be running down hookers with cars made of bricks, but you will be traversing massive open worlds as you take on missions from hubs scattered across the maps. Since the gameplay directly reflects the building component, players are encouraged to tinker with their designs to excel at different mission types. You'll end up building a racecar for speed runs, a vehicle armed to the teeth for combat, and even a vehicle that can catch soccer balls. You never really know what to expect from the missions, but one thing is certain: They push your skills to the limit, and pump out fun. In addition to the challenging single-player adventure, players can put their creations to the test in enjoyable online matches. If you are feeling generous, you can share your blueprints with other players. Nuts and Bolts shows that Rare is still a respectable think tank capable of delivering experiences unlike anything else, but this game also clings onto a few annoying elements from the company's past. The biggest one, which the game openly ridicules, is the concept of scouring environments to collect items. Sadly, the items you must collect are new part types for your vehicles. If you want to have a deep LEGO box, you have to dedicate time to hunting for them. Annoying collect-a-thon aside, Nuts and Bolts is a rare delight that offers up big laughs and inventive gameplay. It also ends up being the closest thing there is to a virtual LEGO set.